"I can’t go back in that place again, it was too painful,” the 10-year-old girl said through tears. "It hurts too much." 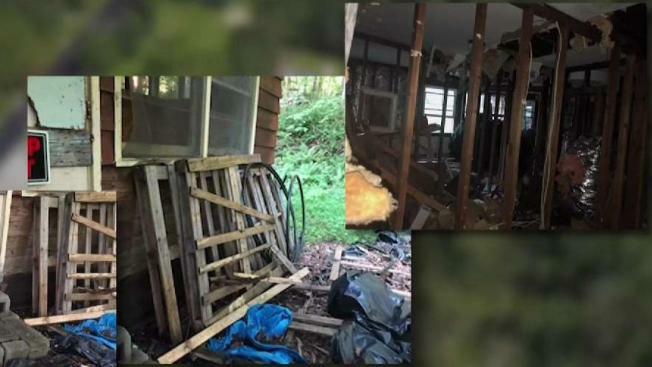 A 10-year-old girl was wounded after playing outside an abandoned building at her New York day camp -- and it was her counselor who took her there, the I-Team has learned. Micaela Aguero says it was Friday, July 13 when a counselor took her group at Putnam Valley's Camp Combe to an abandoned building 100 yards from the camp activity the girls had been engaged in. "When we have that activity, we’ve been to that house before,” Aguero said, but she said that day was different. "It looked abandoned and scary and it was Friday the 13th." Aguero says she was playing hide-and-seek with her friends outside the house when she ran past rolled up wire fence and cut her leg. The gash across her thigh was several inches long and she began to bleed. "I was screaming and my friends came and said, 'Oh my God, what happened?'" the 10-year-old recalled. "It felt like a needle was slicing my leg." Aguero says she was first brought to the nurse’s office and then to the main office, where she waited for her parents to pick her up. "She was in a lot of pain, crying and scared," said her mother Lourdes Delgado. "How could they just let her sit in an office with an open cut like that?" The president of YMCA of Central and Northern Westchester, who owns the camp, told the I-Team that first aid protocol was followed. "The camper was seen by an EMT and registered nurse on staff," the statement said. "The office called the camper’s parents to report the injury. Our medical team suggested the camper be further assessed by a physician." At the hospital, Aguero needed 17 stitches to close up the wound and will likely need a plastic surgeon to help with the scar. The I-Team asked the camp why the injury was not reported. The camp referred only to the original statement and said the incident has been thoroughly investigated. The counselors were also disciplined and re-trained on the “hazardous areas” of the camp, camp officials said. The Putnam Valley buildings department has ordered the abandoned structure be taken down in 90 days. Delgado stopped sending her daughter to camp after the injury, but she hopes her story will let other parents know what happened and prevent future injuries. "I can’t go back in that place again, it was too painful,” Aguero said through tears. "It hurts too much."